Approach: Park at Thompson Creek, 10 minutes east of the Banff Park boundary on the David Thompson Highway. Ski or snowshoe up the east side of the creek for about 1km until the creek forks, watch closely as this can be easy to miss. Follow the Left (West) fork for about 1 hour to the base of a large avalanche path on your left. The route is easily visible another hour away at the top of the avalanche path. The feature is visible from the road, but you can’t tell if the ice is formed without walking in. The route from the highway. 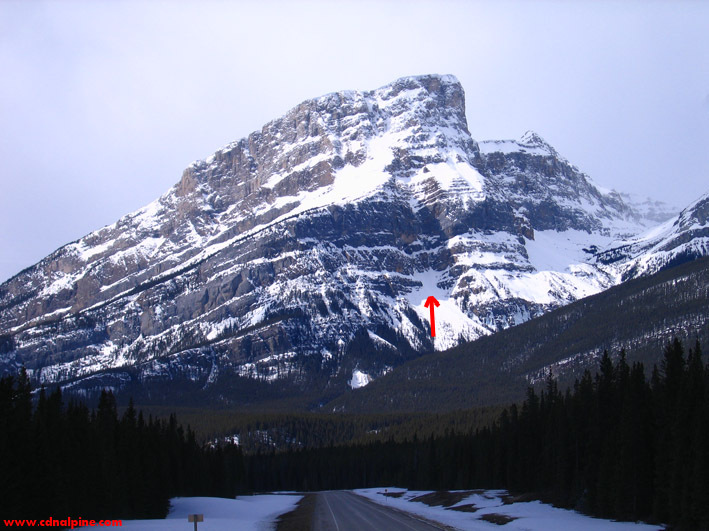 Route Description: This exciting route was first climbed in March of 2008 by J. Mills & Brent Young under the cover of darkness to minimize rock fall and avalanche hazard. There is major avalanche, cornice, and rock fall hazard on this route. All 3 were encountered on the first attempt, despite conditions being quite good in the general area. Choose your day (or better yet, night) wisely and expect some spindrift. 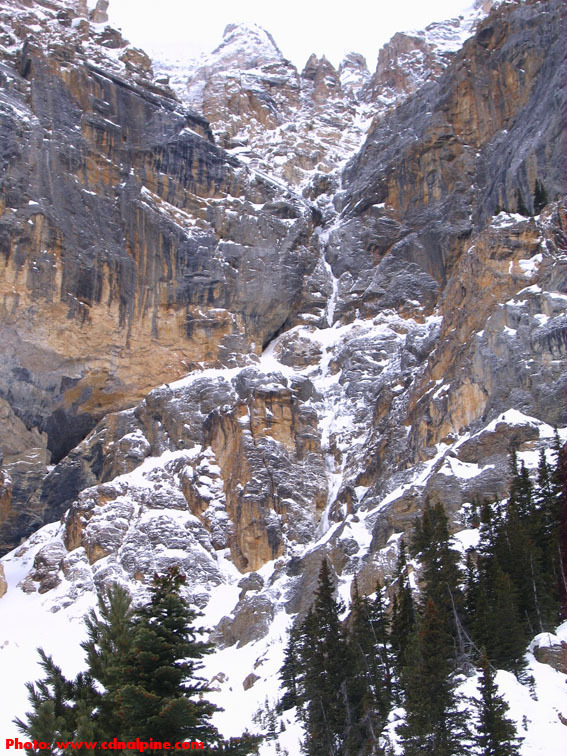 The climb follows the obvious gully from bottom to top. P1: (WI3R, 60m) Up thin ice and steep snow to a fixed nut belay on the left at 60m. P2: (WI4R, 40m) A steep and thin start leads to easier but climbing. Somehow get a belay on the thin ice or rotten rock at a snow ledge. P3: (WI5X, 30m) Low angle detached ice leads to an 8 meter section of slightly overhanging rotten ice. Belay on the snow ledge above, with a rock anchor (fixed nut + pin) on the left. P4: (WI 5, M6, 60m) A fantastic pitch. Pull through a couple body lengths of overhanging rock with good gear (including a fixed pin) onto the thin, broken curtain above. Wrestle in some rock gear above then continue up past another fixed pin to a belay at the end of the real climbing. Fixed nut. P5: (WI3, 30m) Romp up the final 30m of snow and rambly ice if you feel so inclined. Just before the sky started falling on the first attempt. Descent: Rap the route quickly, plan on leaving some nuts and/or pins behind to supplement the existing ones. 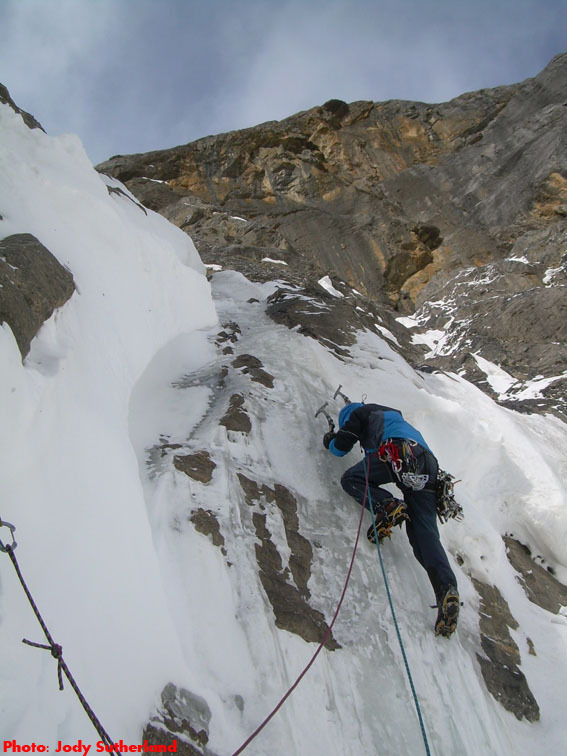 There was no ice thick enough for v-threads on the first ascent. Gear: 5-6 screws, mostly stubbies; 1 set cams to #3 Camalot, 1 set nuts, 6-8 assorted pins including KB’s, 1 Spectre. Virtually all pro is in the rock. Objective Hazards: Tons of hazard from above including avalanche, ice fall, and rock fall. Timing is everything.